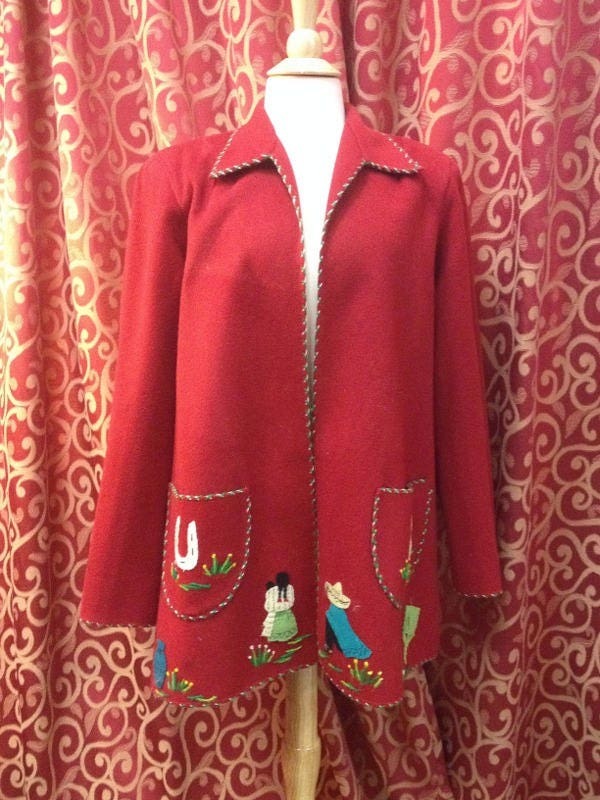 1940's, 38 bust, red wool, hand made, Mexican jacket. 1940's, 38" bust, red wool, hand made, Mexican jacket. 1940's, 38" bust, red wool, hand made, Mexican jacket. Entire front of jacket, front opening, collar, and hem edged in white and cross stitching. 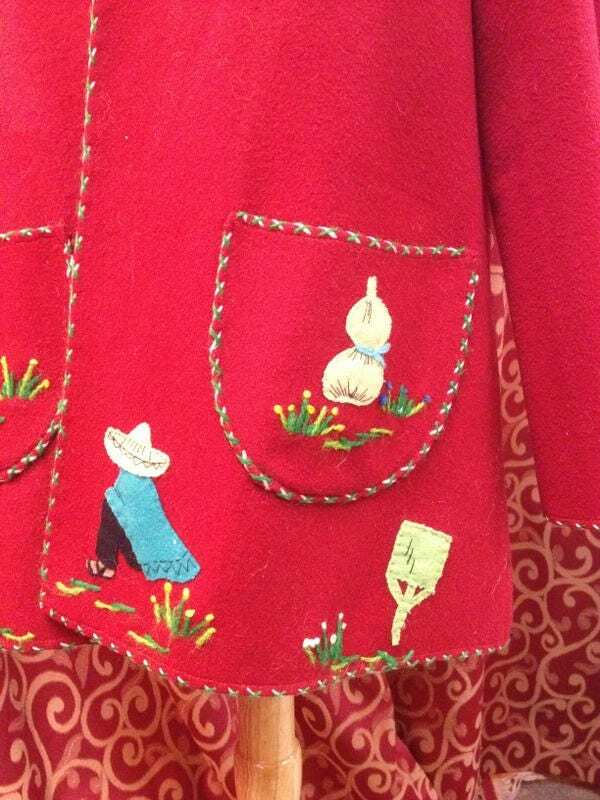 Patch pocket, in front at each hip, is also edged in same hand stitching as well a applique in center of each pocket. 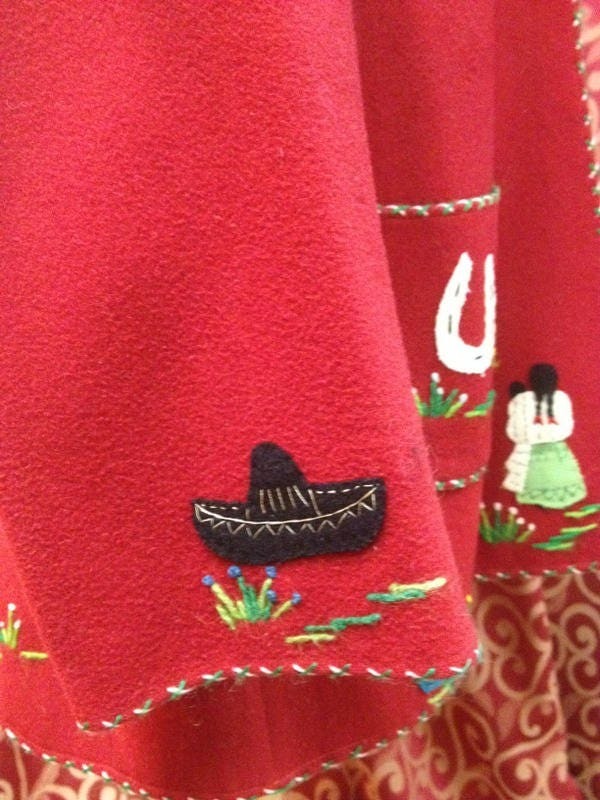 At the bottom of jacket, right side, has applique of a man with blue poncho, black pants, and white sombrero. 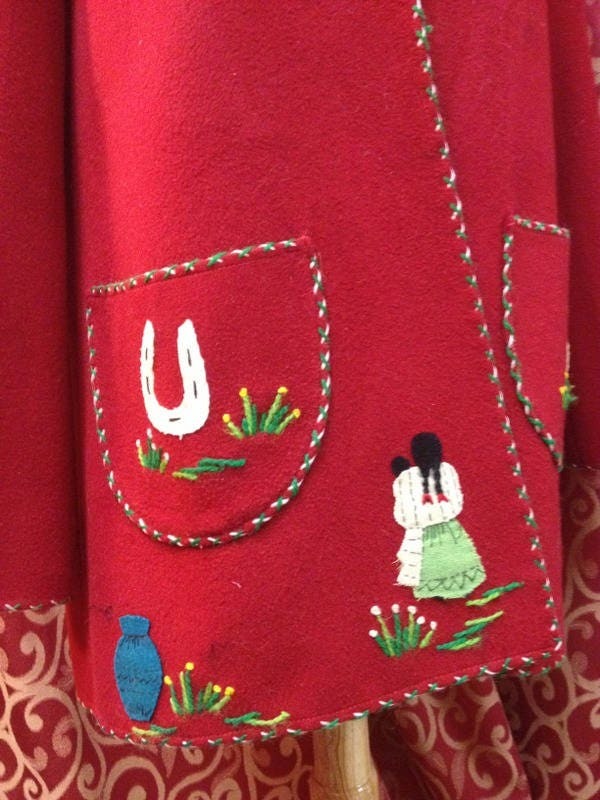 Left side, front of jacket, has an applique woman with white serape, long black braids, green skirt, and a small brown baby head. 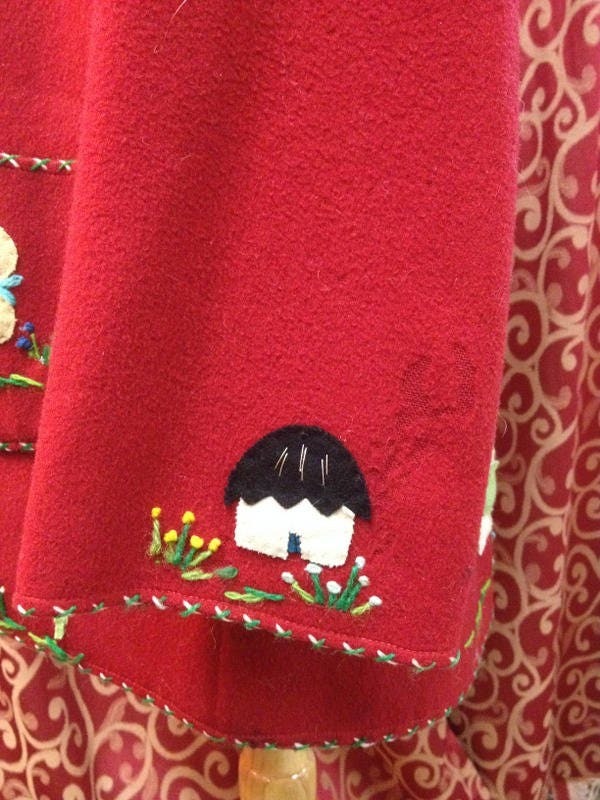 Appliques are at the bottom of each sleeve. 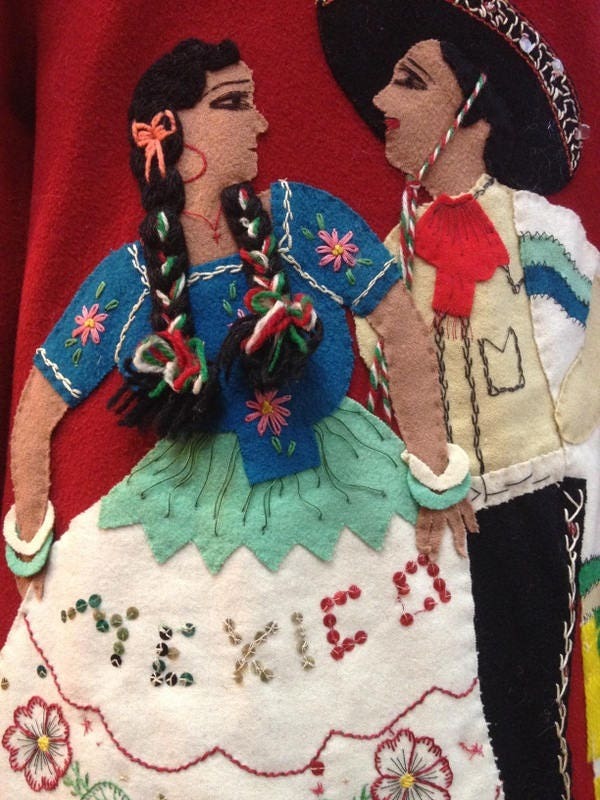 Back of jacket, has full length Senor and Senorita, dancing,. The man is wearing a black sombrero with red edging, tan jacket, black pants, white and green serape. Senorita has long black braids with red and green ties. She is wearing a turquoise colored top with pink flowers, a white full long skirt with red embroidered flowers, with red and green sequence spelling Mexico across skirt. . Label reads " La Mexico" Fabrica de Mexicano, Caderextos, N.L.